You wouldn’t believe how hard it is to find a local place in a tourist town. J and I went on a quest to find something that wasn’t going to be cheesey or touristy, but we didn’t have an Internet connection in our cabin, so it was real hard to research. I can’t tell you the last time we went without Internet for 48 hours, but we made do. The plan was to head back in to Sevierville because we noticed a county courthouse on the way in. There’s got to be a pub or something near the courthouse, right? I mean, where do employees go for dinner and a beer? Well, it’s not in downtown Sevierville, that’s for sure. There was nothing. One place but it looked fancy and didn’t have a menu outside so we passed. Instead, J got her GPS out of her purse to see what sounded local. 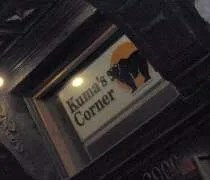 Kuma's Corner on W. Belmont on Chicago's northside. We finally made plans to make the trip the north side of Chicago. We had to pick up the first of three out-of-town bridesmaids who flew in early to stay with another friend who lived in Bucktown. We offered just to pick her up at her friend’s place because it was only a ten minute drive to West Belmont and I’d finally get to chow down on Illinois’ best burger. The next week is going to be really busy for me. It’s a change of pace and actually a welcome change of pace. I’m starting to get some work now that fall sports are getting under way which means a lot more traveling and a lot less time playing Wii. A friend of mine was driving through on his way to Plymouth where he’s spending the weekend. He’s working for SPEED this week at MIS and Plymouth is where is hotel is. Since today was a travel day, he asked if I wanted to meet him for lunch somewhere. The original plan was to meet in Ann Arbor because he was going to take I-80 to Toledo then head north. For some reason, he changed his mind and took I-94 from Chicago. Since he was taking 94, he was open to meeting somewhere closer for me. Jackson seemed like a good stopping point for both of us, so I started looking for places to eat. We don’t get to Jackson very often, so I’m not really familiar with what’s there. I put a post on Twitter asking for suggestions and I did get a reply from one person. @ddkronkh pointed me to an article that was in the Jackson Citizen-Patriot about the Top Ten sandwiches in Jackson. I wanted to eat all of them, but I had to pick one. LeRoy's Classic Bar & Grill on South Cedar Street in Lansing. You know how there’s always a place you drive by but never stop at? LeRoy’s was that place for us. 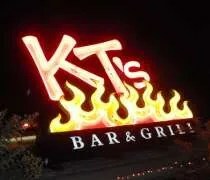 In fact, we drive by it so much, J actually thought we had eaten there before. It just seemed familiar because we take that route to downtown Lansing quite often, but it’s a place we had neglected. There wasn’t a reason we never stopped. I just never thought of it when it came to dinner time. J and I left downtown after spending the afternoon at Oldsmobile Park. By the time we hopped back in the car, I was really hungry and wanted something really greasy. I heard somewhere that LeRoy’s had a pretty good burger and it was on the way home, so we finally stopped neglecting the little neighborhood bar. 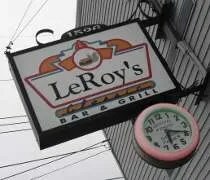 LeRoy’s Classic Bar & Grill is on South Cedar Street at Baker. There’s a parking lot on the north side of the building and behind the building. It was still pretty early on a Saturday night, so parked in the lot on the north and entered through the front door which opens out to Cedar Street. We didn’t make it to far past the bar once we got inside. It took my eyes a second to adjust as it was pretty dark. There are a couple booths along the wall just inside the door and I suggested we grab one of those so we’d be noticed by the bartender. When I see that there’s a place that serves a burger someone has proclaimed to be the best, I’m gonna take an opportunity to try it for myself. That was the case when I was working in Ann Arbor recently. J made the trip to Ann Arbor with me and picked me up after my game was over. Somewhere, I saw that a bar in Ypsilanti made one of the best burgers in the country. I looked at a map and saw Ypsilanti was near Ann Arbor. So I dragged J to another bar in search of the perfect hamburger. 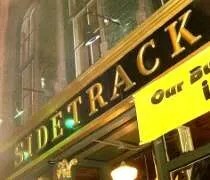 Sidetrack Bar & Grill is located on Cross Street in Ypsilanti’s Depot Town. Guess what. It sits beside a set of rail road tracks. As I’ve already alluded to, GQ Magazine proclaimed Sidetrack’s hamburger as one the 20 burgers you must eat before you die. It was also featured on an episode of the Oprah Winfey Show. With that much hype, it was something I was looking forward to all day. 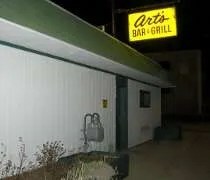 Art's Bar & Grill on Kalamazoo in Lansing. 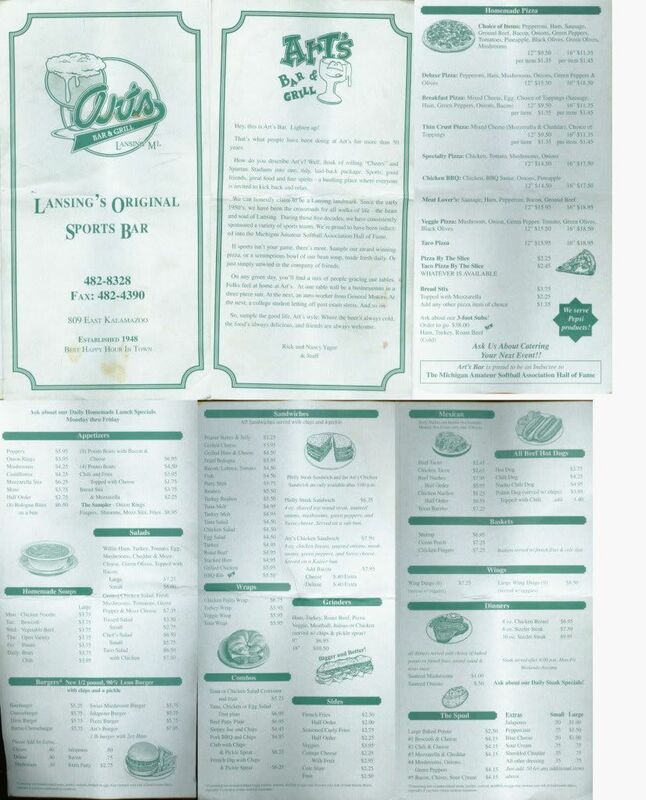 It’s been almost a year since our first visit to Art’s Bar & Grill. It was one of the first places we ate at after moving to Lansing. 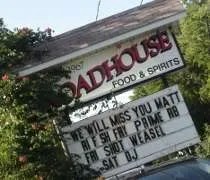 The building didn’t look like much, but I had heard the food was some of the best in town. After a little hesitation, we went in and had one of the best meals we’ve had in town. J’s parents were in town and we needed someplace to eat. The original plan was to eat in Mt. Pleasant after gambling for a little bit, but we were still full from lunch, so we headed back to Lansing. We tossed around a few ideas, but eventually settled on Art’s. I had heard good things about their pizza and we hadn’t tried it yet. By hitting up a bar, we could get a pizza and J’s parents could get burgers. After taking care of some things this morning, my girlfriend, her family, and I headed out for lunch. Our first stop was Palermos 95th (review HERE), but they were even packed for lunch, so we went to J’s parents favorite bar in downtown Oak Lawn. 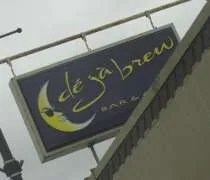 Deja Brew Bar & Grill is located on 95th Street in downtown Oak Lawn. It fronts the busy highway, but the parking and main entrance is actually in the back which is accessible by an alley. When you walk in that back door, you come into an enclosed courtyard. From there, there’s another set of doors to actually enter the establishment. Inside is a typical sports bar. There are LCD’s hanging from the ceiling. There’s a large, odd shaped bar that takes a good chunk of the space. The shape of the bar is a little hard to describe. Around the bar are a few pub tables. Along the opposite wall is a step up with more tables. We took a table near the windows and waited for a watiress.